My skin has been (surprisingly) well-behaved in the last few weeks, something that's pretty rare so I am definitely embracing it! 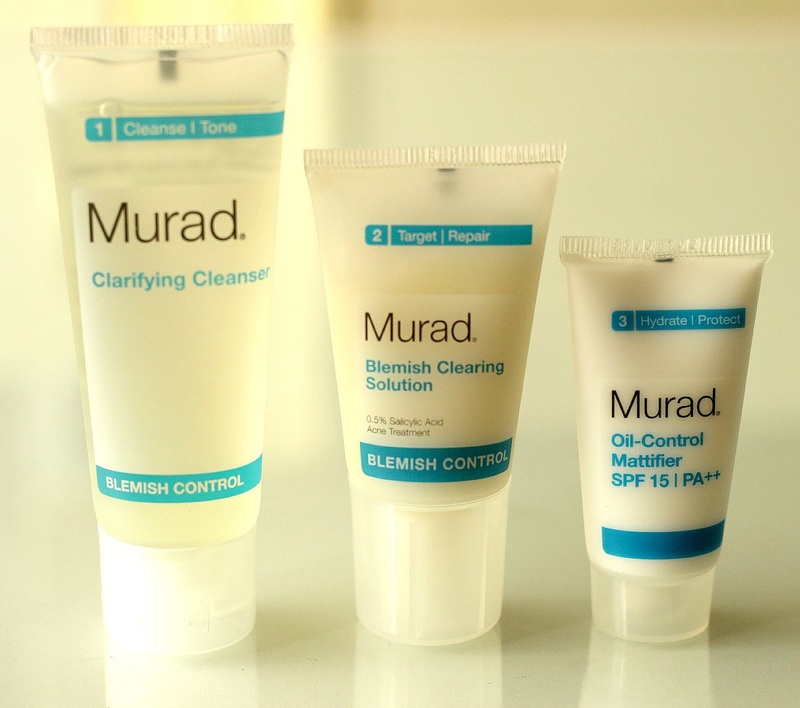 Over the last few weeks I've been using the Murad Blemish Control Travel Set* and my skin has been thanking me. The set comes with three deluxe size products: the Clarifying Cleanser, Blemish Clearing Solution and Oil-Control Mattifier SPF 15 PA++. Murad is one of those brands that I've heard really great things about, so I was really excited to give some of their products a try. Since summer is holiday season, this would be a great kit to take with you on your travels since the products comes in a cute makeup case. The Clarifying Cleanser I like using to remove my face makeup at night, and I will repeat cleansing a second time to remove as much dirt as possible. The gel actually feels really refreshing and cooling thanks to ingredients such as menthol, lemon and orange peel oil. As you can imagine, the scent is really pleasant as well - it's not one of those awful chemical scents that makes you terrified to even put it anywhere near your face. I think a combination of this product along with the others also really helped clear my skin. The Blemish Clarifying Solution is an acne treatment containing 0.5% salicylic acid, and unlike a spot treatment, can actually be used on the entire face, neck and chest area. I've been applying this one right after the Clarifying Cleanser in my night routine. I'm not the biggest fan of salicylic acid since I've never noticed it specifically improved my skin but something about this skincare system seems to be doing the trick. I cannot for sure attribute my skin clearing success to this product alone, however combined with the others mentioned here, it has been doing wonders for my skin. Finally, the Murad Oil-Control Mattifier SPF 15 PA++ comes in handy as a daytime moisturizer. Probably my least favourite from the bunch since the scent isn't very appealing, but since it hasn't broken me out I can look past that. It works well as a mattifier too, I don't have to reach for a primer when using it (which I usually have to do this time of the year because it get's so hot and humid out here), so that's a big plus. It wears really well under both liquid and powder foundation, too. 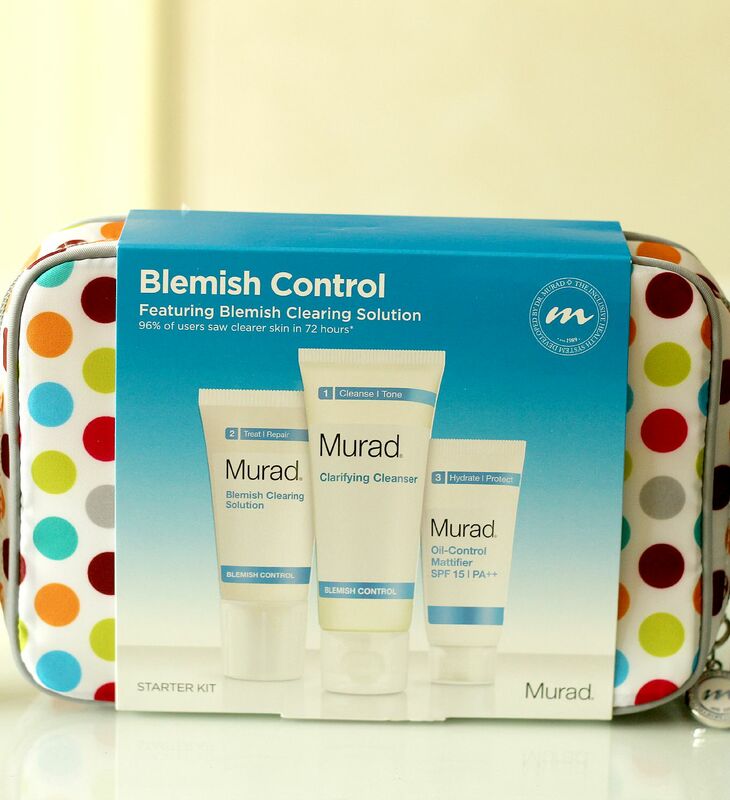 Needless to say, my skin has been loving the Murad Blemish Control Travel Set! This kit retails for $40, and it is a great introduction kit to the brand if you are looking for an effective solution to your stubborn breakouts. 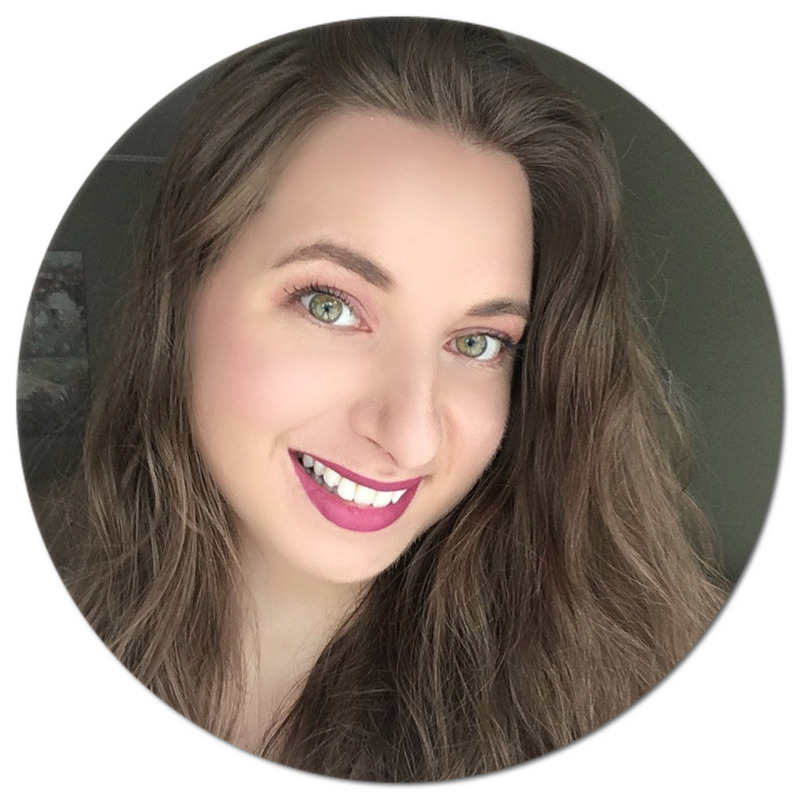 Murad Canada has kindly offered my readers free shipping until August 15th when using the code LOVE at checkout, so if you wish to save on your order, now's a great time! Do you also have acne-prone skin? What is your go-to blemish control product/brand? I haven't tried too much from Murad (just the mattifier), but I like what I've tried so far! The clarifying cleanser sounds like it smells SO GOOD, so will sniff that next time I'm at Sephora. Not a fan of salicylic acid, as I find it makes my acne worse? My sister has very acne-prone skin and this sounds very helpful. Thank you for the review! Thank you for the useful review!